"It was just so hard to believe that wheelchair-bound people living on machines, that that would be me in two years," Andrea Peet says on learning that she was diagnosed with ALS. 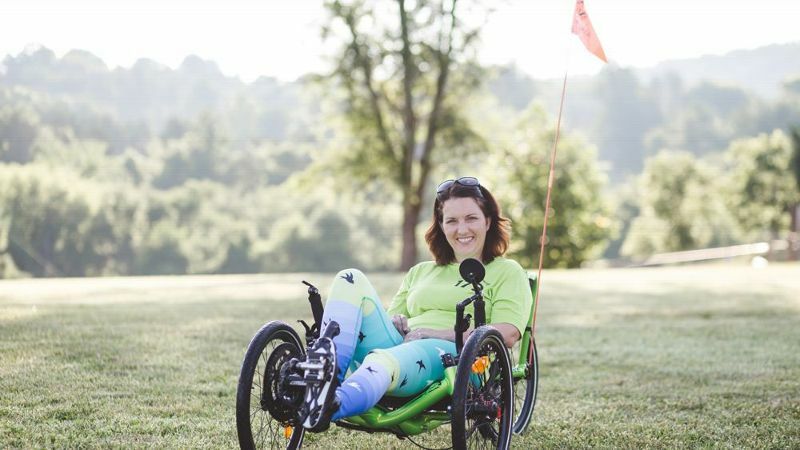 On a mid-July morning in Charlottesville, Virginia, with the sun rising slowly over the foothills, Andrea Peet, 36, pedaled her recumbent trike to the gravel-path start line of a 10K. As the race director yelled, "Here we go!" Peet, the only participant on wheels, began pedaling. Her neon athletic pants, adorned with black sparrows, matched her electric yellow 'Team Drea' T-shirt as she sped downhill at an 8:30-per-mile pace. She gripped the trike handles to steer, maneuvering steadily on sections of flat terrain. The hills were Peet's biggest challenge: As she willed her leg muscles to work, she needed a push. Peet smiled and talked with a fellow participant as she rode the course. "That is awesome -- you go, girl!" an elderly walker yelled as Peet rode by. She completed the 10K course in 62 minutes, placing 16th out of 28 competitors. Afterward, she sat on her trike, talking with friends and posing for photos alongside her husband, Dave. She admitted that her thigh muscles struggled on the hills, and that her left leg wasn't as capable of pedaling straight. While it wasn't her fastest time, she was happy to complete her sixth race of 2017. She was still racing independently -- a feat in its own right, since she wasn't sure she would even be alive as little as three years earlier. August marks the third anniversary of the Ice Bucket Challenge, which raised more than $220 million for amyotrophic lateral sclerosis, or ALS, research. When the viral craze began, Peet sat at her computer, watching with a "morbid fascination," as everyone from IBC co-founder Pete Frates to NBA star Stephen Curry dumped buckets of ice water over their heads. 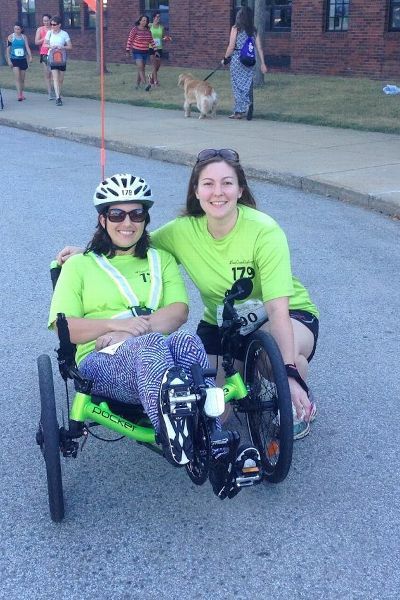 Andrea Peet and her best friend, Julie Wesner at the 2014 Ramblin’ Rose sprint triathlon. For the seven months leading up to the challenge, Peet had struggled with an undiagnosed illness. Her symptoms had been almost unnoticeable at first: an occasional inability to clap, minute voice changes, tight hamstring muscles. She attributed the last symptom to her intense training and race schedule for the five triathlons she'd completed that year, including a half Ironman. In January of 2014, Peet, then 33, visited a Johns Hopkins neurologist, who performed an EMG test and initially ruled out ALS. She visited five more neuromuscular specialists, none of whom had a definitive diagnosis. Peet, who is 5-foot-3 with wavy brown hair, had started walking with a cane. She then transitioned to two walking sticks and finally, a walker. When she spoke, she sometimes stretched out syllables a beat longer, which her husband noticed when listening to her voicemail messages. In late August, still frustrated and searching for answers, she returned to Johns Hopkins. This time, the EMG test led to an official diagnosis: ALS, a progressive neurodegenerative disease that affects the brain and spinal chord and can lead to paralysis. Peet had never known anyone with ALS. But watching the IBC videos had familiarized her with what it likely meant. "It was just so hard to believe that wheelchair-bound people living on machines, that that would be me in two years," Peet says. After leaving the doctor's office, Peet and her husband returned to their hotel room. They ordered Chinese take-out and began trying to process her diagnosis. They had just bought a house and had planned to try and start a family. As they spoke, she found a YouTube video of Jon Blais, a former Ironman triathlete who completed the World Championship in Hawaii after being diagnosed with ALS. "I'm going to find a race that I can do -- and I'll finish it," she says told her husband. "It may be the last one I can do." The average life expectancy after an ALS diagnosis is two to five years, according to the ALS Association. The disease is also known as Lou Gehrig's disease -- named after the famed Yankee baseball pitcher who was diagnosed on June 19, 1939 (his 36th birthday). Peet's diagnosis indicated that her ALS was focused on her body's upper motor neurons, which send messages from the brain to the spinal cord. No two cases of ALS are identical, and doctors couldn't give Peet a precise life expectancy outside of the two-to-five year window. But she'd read the statistics. She was determined to keep her body moving for as long as possible. Several weeks after her diagnosis, Peet signed up for the September 2014 Ramblin' Rose sprint triathlon. Because she could no longer balance on a bike, Peet bought a recumbent bike (trike). She practiced swimming freestyle with her mother watching poolside. Peet's best friend, Julie Wesner, bought a bike and decided to race alongside her. Of the 565 participants, Wesner and Peet finished 564th and 565th, respectively. More than 100 spectators stood on the sidelines, cheering, as the duo finished in three hours and 23 minutes. "It was like the greatest thing that ever happened," Peet says. "It just changed everything." 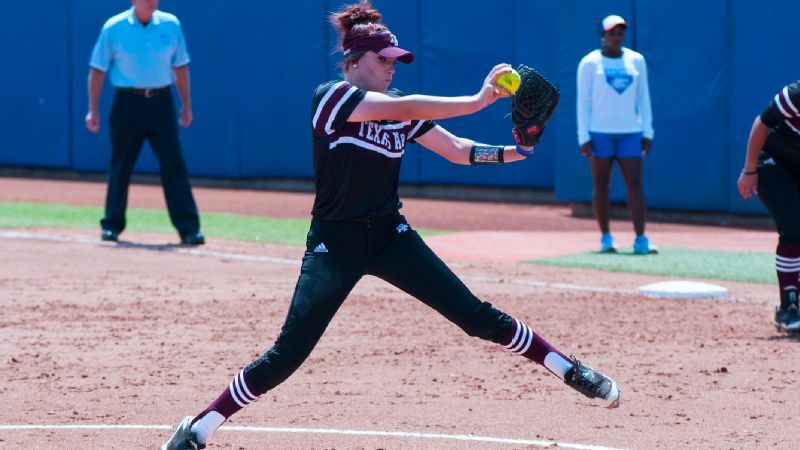 Afterward, Peet received messages from friends and family members, all of whom were inspired by her determination. "I thought, what if we challenge my friends to pick a race that's a challenge to them and then use it to raise money for ALS research?" Peet says. She set an initial goal to raise $5,000, but quickly surpassed that mark. She continued her own racing, finishing three races in 2015 and setting a 2016 goal of completing 12 (which she did). While her symptoms gradually progressed, her 2016 marathon time was faster than her 2015 finish. That time improvement -- as well as Peet's gradual physical decline -- is not "typical" of ALS patients, many of whom are wheelchair-bound with very limited muscle control, or else have died within three years of their diagnosis. Even today, Peet's symptoms are still mostly upper motor neuron, meaning that while she might move slowly, her lower motor neurons are still able to carry the message to the muscle, which can subsequently flex to walk, talk, eat or type. In other words, while Peet does need assistance buckling her bike helmet and completing other tasks that require her fine motor skills, she can still perform most daily functions independently. In 2016, Peet and her husband moved from their Washington, D.C., home to Raleigh, N.C., in order to be closer to Peet's parents. The move also put them in close proximity to Dr. Richard Bedlack, a neurologist and ALS researcher at Duke University's health system. That same year, she founded the Team Drea Foundation as an official way to continue fundraising and raise awareness about ALS. To date, Team Drea has raised more than $165,000, which is donated to three organizations working on ALS research. Peet's idea to start a Foundation is shared by many people diagnosed with ALS. Pat Quinn, who co-founded the IBC with Frates, was diagnosed with ALS on March 8, 2013. He was 30. He founded Quinn for the Win in June of 2013, and has helped to raise hundreds of thousands of dollars. Today, Quinn is wheelchair bound and eats through a feeding tube. "The hardest part of the day is having to ask for assistance with everything," Quinn wrote in an email. "Literally everything. But I'd say that every moment of every day is the best part. This disease has shown me how amazing life is and finding a passion in fighting it has given me a drive like never before." Thanks to the money raised by the IBC and subsequent 'Every August Until a Cure' campaigns, scientists have made progress toward more effective treatments. The ALS Therapy Development Institute in Cambridge, Massachusetts, developed AT-1501, an antibody that will hopefully slow the progression of ALS (it's currently awaiting clinical trials in humans). In May, the FDA approved Radicava, an intravenous infusion designed to slow ALS. As the first new treatment option approved by the FDA in the last 22 years, Radicava will be available starting in August. "There's so much momentum right now behind ALS, and the technology is in a place that it wasn't 10 years ago," says Gina Combs, whose husband was recently diagnosed with the disease. "We look at ALS as this massive puzzle and every time they discover a new gene, a new pathway, it's like putting another piece in that puzzle." Chris Combs, a fellow North Carolina resident, played minor league baseball for several years. Toward the end of 2015, the 6-foot-7 father of three noticed he had trouble buttoning up his shirts. A year later, Combs, then 40, was diagnosed with ALS. "It's a roller coaster -- each time you hear it, it's like you're being hit by a train," he says. An associate director of annual giving for the N.C. State Wolfpack Club, Combs has connections throughout North Carolina. After his diagnosis, he and Gina wanted to find a way to raise money for ALS research. They founded Team Chris Combs; through the foundation, they hosted the first annual Hope Gala on September 30, 2016. In one night, they raised more than a million dollars. ALS patients have experimented with everything from stem cell treatments to a coconut oil diet in searching for a cure. That's why Dr. Bedlack founded ALS Untangled, which aggregates and investigates alternative and off-label treatments for ALS. "The reality is that, unless you investigate these things, you don't know if they work," Dr. Bedlack says. Former NFL player Tim Shaw was diagnosed with ALS in April 2014. The 6-foot-2, then 235-pound former linebacker for the Tennessee Titans revealed his diagnosis via the IBC that summer. "My body was doing so physically well that it was hard to believe," says Shaw, 33, his voice slurred but steady. "But over time, my mentality became one of positivity and fighting." Shaw has tried various cures, from drinking fermented soy to stem cell treatments in Israel. He has also participated in clinical trials at Vanderbilt University and the ALS Therapy Development Institute. But his ALS symptoms worsened. He can walk, though he often relies on a wheelchair. He has lost 45 pounds and sometimes utilizes a feeding tube. His parents live with him to help him each day. Shaw maintains his business investments, speaks nationally and travels with friends whenever possible. He is a major advocate for ALS awareness and fundraising and his autobiography, "Blitz Your Life," was published earlier this year. "I can't wait to find out what actually causes ALS because I'll tell you what: It seems to be a disease that goes after people with a very active lifestyle," Shaw says. "Everyone that I know [with ALS] is somehow active, like they played football or run marathons." So far in 2017, Peet has completed three half marathons, two 10Ks, a 5K and a nine-mile trek ride (she has two marathons and three half-marathons scheduled for this fall). She dedicates each race to someone fighting ALS, sharing his or her story on her blog. She swims twice a week, practices Pilates two days a week (sessions that Peet calls "revolutionary" and credits with giving her stronger core stability, greater range of motion and a stronger diaphragm) and rides her trike. Although her speech is hard to understand at times, she is quick to crack a joke, especially when teasing her husband. She is very active on social media, particularly within the ALS community, and has been asked to speak at several national events. Until the puzzle is complete, Peet and so many others will continue to fight, so long as long as they remain physically able. "When you are diagnosed with ALS, you can completely shut yourself in or you can have the opposite response, which is what Andrea has had," Peet's husband says. "She's transformed into this force of nature. She connects with people in a way that she didn't before. What is happening to her is horrible, yes. But the way she's approached it ... I'm just happy I get to be with her in this journey and to see how she's connecting with people. It's been amazing to watch."